In the small village of Madnapur in Surketh district, Nepal, lives Rampyari Thapa. She has been rearing backyard poultry for six years. “Almost all my chickens would die, some would even suffer from paralysis,” she says recalling her struggles to keep her chickens alive. Her family owns only a small piece of land and so farming isn’t a viable livelihood option for them. However, things took a turn for the better when two years ago she met a Community Agriculture Veterinary Entrepreneur (CAVE), who informed her that poultry mortality could be avoided. The CAVE informed her that her birds were most likely dying due to Newcastle Disease or ‘Ranikhet’ disease as it is known locally, which was preventable through vaccination. The CAVE introduced Rampyari to vaccination and highlighted to her the symptoms to look out for and other preventive measures. She was also taught how to vaccinate her birds against the disease. Today, Thapa has 18 healthy birds, each of which will fetch her NPR 1000 (US $ 10) in the market. She regularly vaccinates not just her own but her neighbours’ poultry as well and there have been no outbreaks of ND in her neighbourhood since. She has plans to grow her modest flock size to more than 300 chickens, an ambition that was unimaginable six years back. Newcastle disease (ND) or Ranikhet is a major cause of high poultry mortality, the effects of which are felt most acutely by the backyard poultry (BYP) keepers in rural Nepal who are from disadvantaged communities. Although vaccines are available, these were used almost exclusively by commercial farmers as BYP farmers were unaware of both the disease and preventive measures. This, in addition to inadequate knowledge of good husbandry practices also meant that backyard poultry only remained a supplementary means of income. The sector however, presents a great opportunity for income generation. According to a 2016 report by Heifer Project International Nepal, backyard poultry contributes significantly to Nepal’s poultry produce accounting for 16% of the total egg production and 13.5% of chicken meat production. 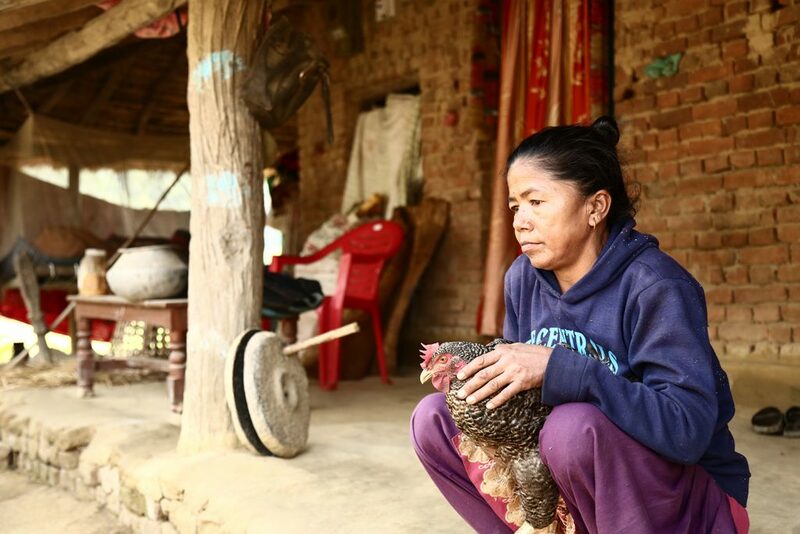 Recognising this, the Global Alliance for Livestock Veterinary Medicines (GALVmed) in partnership with Heifer Project International Nepal initiated a project for sustained control of Newcastle Disease (ND) in Backyard Poultry through vaccination. Another objective was to increase income and nutrition of BYP farmers in the project area. The two and a half year project which ran from September 2013 to March 2016, covered 50 village development committees in Banke, Bardiya and Surkhet districts. These districts used to experience regular bi-annual outbreaks of Newcastle Disease in April-May and August– September, killing up to 90 % of poultry. The project was designed to mitigate problems of backyard poultry by creating awareness about improved BYP farming, and the benefits of regular deworming and ND vaccination using quality vaccines. The farmers however, needed to be sensitised to voluntarily get their birds vaccinated, to pay for the services and to view such expenditures as an investment towards a profitable agri-business. Activities facilitating behavioural change at the grassroots were thus a major focus area. The project team created awareness on basic health care, vaccination, bio-security and backyard poultry management in project areas using tools such as street theatre, radio, posters, mobile vans with loud speakers, wall paintings and hoardings. Meetings were also held with representatives of self-help groups, village animal health workers, community facilitators and other local stake holders to come up with an affordable fee for each dose of vaccine. The project also leveraged on existing network of trained CAVEs who sold and administered these vaccines. The CAVEs’ capacities were further bolstered by training them in BYP economics, health and husbandry and transporting vaccines safely using cool boxes. Seven different ND vaccination and deworming campaigns were then conducted in project areas with help from local Community Animal Health Workers (CAHW), local partner NGOs and staff of the District Livestock Service Office (DLSO) of respective districts. Dil Kumari Thapa, a backyard poultry farmer from Kunathari, Surkhet, was struggling to tackle ND outbreaks when she came across a street play teaching techniques to protect poultry from ND. She got in touch with the local Village Animal Health Worker (VAHW) and received training in vaccination and improved health & husbandry practices. “Earlier I could only sell between eight to ten chickens annually as other birds would die. Things began improving when I built a new shed with materials available locally and began giving supplementary feeds along with regular deworming and vaccination,” Dil Kumari explains. By the end of the project, the number of farmers vaccinating their chicken against ND had increased from 19.8 % to a whopping 73 % according to the project report. These farmers have experienced increased egg production which has led to significant increase in flock size, with the average flock size per household increasing from 4 to 9. The project also reported an increase in annual income from poultry by an average of NPR 18303 or US $ 177 per household resulting from increased poultry and egg sales after intervention. Recognising the benefits of vaccination, farmers are increasingly willing to pay for vaccines in subsequent campaigns. The increased sales of vaccines has resulted into an increase in profits for stakeholders across the value chain – farmers, retailers, veterinary health workers and CAVEs. Annual expenditure on medicines and vaccines for instance went up by 38%, expenditure on vet fees increased by 173%, there has also been a 100% increase in poultry house maintenance expenditure and 39% increase in expenditure on poultry feed. “I am able to earn much more from my poultry in a shorter period and my business requires less capital but has a good market.” concludes Dil Kumari, testifying that this has enabled her to save up and construct a water tank to irrigate her vegetable garden. The cumulative impact on the mindset of the larger community is also noteworthy as neighboring villages and other organisations including government offices like district livestock service offices (DLSO) are beginning to replicate these interventions.